To investigate predictors of visual outcomes in patients who underwent vitrectomy for full-thickness macular hole (FTMH) with at least 1 year of follow-up. Retrospective, noncomparative, consecutive case series of 132 eyes of 122 patients who underwent surgical repair of idiopathic FTMH with at least 1 year of follow-up. Predictors of visual acuity (VA) outcomes were analyzed using linear regression. Mean follow-up time was 22.2 months. Twenty-three eyes (17.4%) had age-related macular degeneration (AMD), of which 17 (73.9%) cases were mild and nonexudative. At final follow-up, poor preoperative VA (P < .001), perioperative complications (P < .001), AMD (P < .001), and delay from preoperative evaluation to surgery (P = .037) were significant predictors of final VA. In multiple regression, these variables remained significant (P < .001, P = .011, P < .001, and P = .002, respectively). Poor preoperative VA, perioperative complications, AMD, and delay to surgery were significant predictors of final VA following FTMH repair. 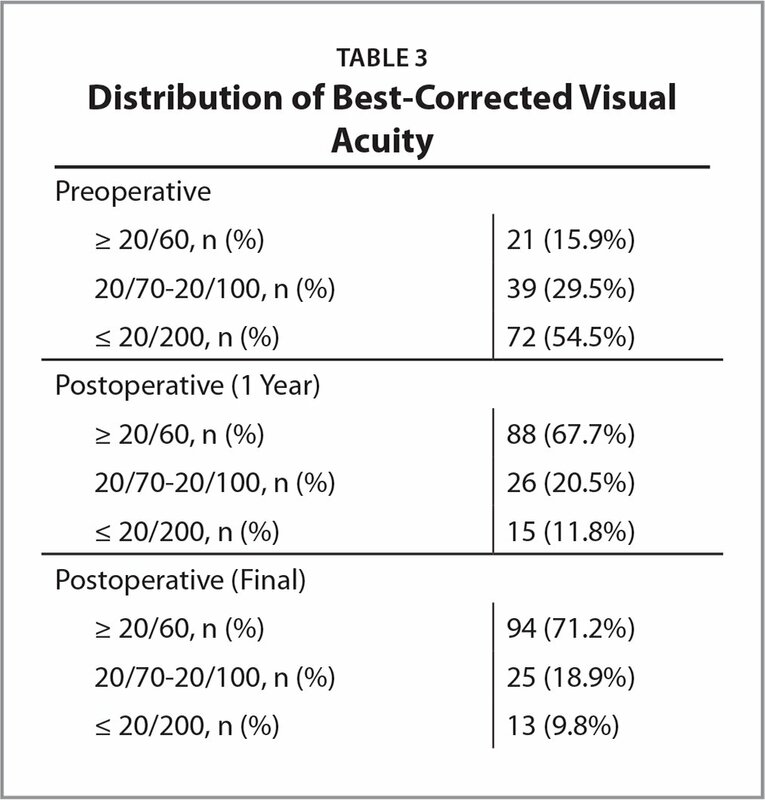 Preoperative, intraoperative, and postoperative factors have been investigated as potential predictors of final visual acuity (VA) following surgical repair of FTMH. Two well-established preoperative factors are symptom duration and preoperative VA.2,6,7 Although these predictors remain relevant, much of the data on FTMH outcomes and outcome predictors were collected before the era of small-gauge transconjunctival vitrectomy systems (23-, 25-, and 27-gauge systems), with limited follow-up, and with limited evaluation of comorbid ocular conditions. The work presented herein sought to investigate a diverse array of longer term predictors of VA outcomes in patients who underwent small-gauge vitrectomy for FTMH with greater than 1 year of follow-up. The current retrospective, consecutive case series was conducted with institutional review board approval, adhered to the tenets of the Declaration of Helsinki, and was HIPAA-compliant. Medical records of all patients who underwent PPV with ILM peel for FTMH at a single institution (Retina Consultants of Houston, Houston, TX) between November 1, 2012, and April 6, 2016, with at least 1 year of postoperative follow-up were reviewed. Cases were excluded if the patient presented with a combined retinal detachment and FTMH or had prior PPV. Predictor variables analyzed included age, race, gender, history of smoking, presence of diabetes mellitus (DM), presence of age-related macular degeneration (AMD), preoperative best-corrected VA, intravitreal ocriplasmin (Jetrea; ThromboGenics, Leuven, Belgium) use prior to surgery, delay (days) from preoperative appointment to surgery, surgical instrumentation gauge, and the presence of peri/postoperative complications (including any of: retinal detachment, failure of FTMH to close, or reopening). The diagnosis of FTMH was confirmed by review of documentation and OCT at the clinic visit immediately preceding surgery. All clinical records prior to surgery were reviewed to determine if intravitreal ocriplasmin had been administered. The date of the clinic appointment immediately preceding surgery and the date of surgery were both recorded in order to determine the intervening time interval. Surgical records were reviewed for vitrectomy gauge. All postoperative records were reviewed to determine whether retinal detachment or FTMH reopening occurred. The main outcome measures were logMAR VA at Y1 and at final follow-up. VA improvements were assessed using paired student's t-tests where appropriate. Preoperative and perioperative factors were analyzed by ordinary least squares regression. Regression coefficients (β) reported represent the estimated change in follow-up VA in the presence of a given binary predictor or per unit in a given continuous predictor. For example, a β of 0.10 for a binary predictor means that follow-up VA was increased by 0.10 logMAR in the presence of that predictor. Multiple regression models were constructed based on variables found to be predictive in univariate analyses and also included control for postoperative cataract extraction. All statistical analyses were conducted in R version 3.3.1 (R Project for Statistical Computing, www.r-project.org). One hundred thirty-two eyes of 122 patients with a mean age of 66.6 years at the time of surgery (range: 19 years to 87 years) were identified with a mean final follow-up of 22.2 months (range: 12.0 months to 49.2 months) postoperatively. Of 122 patients, 80 were female (66%) and 68 of the eyes included (51.5%) were right eyes. Twenty-three eyes (17.4%) had AMD, with 17 (73.9%) classified as mild, dry AMD. Four of these eyes (17.4%) had wet AMD. Collected preoperative, perioperative, and postoperative characteristics are listed in Tables 1–3. Fifty-five (42%) eyes underwent cataract extraction prior to the final follow-up visit. Patients experienced improvement in VA (P < .001) from logMAR 0.94 (Snellen equivalent 20/174) preoperatively to logMAR 0.47 (Snellen equivalent 20/59) at Y1 and logMAR 0.43 (Snellen equivalent 20/54) at final follow-up. Among pseudophakic eyes, VA improved from 0.94 logMAR (Snellen equivalent 20/174) to logMAR 0.47 (Snellen equivalent 20/59) at Y1 and logMAR 0.46 (Snellen equivalent 20/58) at final follow-up. Of 132 eyes, 114 (86.3%) of eyes had improved VA at final follow-up. At Y1, the hole closure rate was 97.7% (129/132). Two holes failed to close following PPV, and another patient developed a new eccentric hole in the superior macula following PPV; repeat PPV was not performed in any of these patients, based on the recommendation of the evaluating physician. At final follow-up, 128 of 132 holes remained closed, with one hole reopening and no repeat PPV performed due to loss of the patient to follow-up. Two eyes underwent a repeat PPV for persistent or recurrent macular holes within the study period. PPV was primarily small-gauge, as 130 of 132 total operations (98.5%) were performed with 23- or 25-gauge instrumentation. The predictive value of various preoperative, perioperative, and postoperative variables was analyzed. Notably, at Y1, preoperative VA (β = 0.28 logMAR per unit preoperative logMAR; P < .001), perioperative complications (β = 0.53 logMAR; P < .001), and presence of AMD (β = 0.25 logMAR; P = .007) were significant predictors of VA. At final follow-up, preoperative VA (β = 0.21 logMAR per unit preoperative logMAR; P < .001), perioperative complications (β = 0.42 logMAR; P < .001), presence of AMD (β = 0.32 logMAR; P < .001), and delay from preoperative assessment (0.004 logMAR per day; P = .037) were significant predictors of VA.
A multiple regression model for Y1 outcomes was constructed with preoperative VA (β = 0.28 logMAR per unit preoperative logMAR; P < .001), perioperative complications (β = 0.43 logMAR; P < .001), presence of AMD (β = 0.25 logMAR; P = .003), and delay from preoperative appointment to surgery (β = 0.002 logMAR per day; P = .228) included as predictors while also controlling for postoperative cataract extraction (β = −0.07; P = .310). Results were similar at final follow-up, with preoperative VA (β = 0.21 logMAR per unit preoperative logMAR; P < 0.001), perioperative complications (β = 0.28 logMAR; P = .011), presence of AMD (β = 0.34 logMAR; P < .001), and delay from preoperative appointment to surgery (β = 0.005 logMAR per day; P = .002) included as predictors while also controlling for postoperative cataract extraction (β = −0.13; P = .023). Coefficients of determination (R2) for the Y1 and final follow-up models were 0.27 and 0.30, respectively. Variables that were not significantly predictive of Y1 or final VA included age, race, gender, history of smoking, DM, intravitreal ocriplasmin use prior to surgery, and surgical instrumentation gauge. None of the ocriplasmin-injected eyes had macular hole enlargement, VA loss relative to baseline, or other monitored complications. FTMH, with a reported incidence of 0.02% to 0.8% per year in those aged 40 years or older, represents a significant macular pathology.1,9 Established preoperative risk factors for decreased VA following macular hole surgery include longer symptom duration and worse preoperative VA.2,6,7 Of note, the majority of studies examining these effects were performed when 20-gauge vitrectomy was most often used. 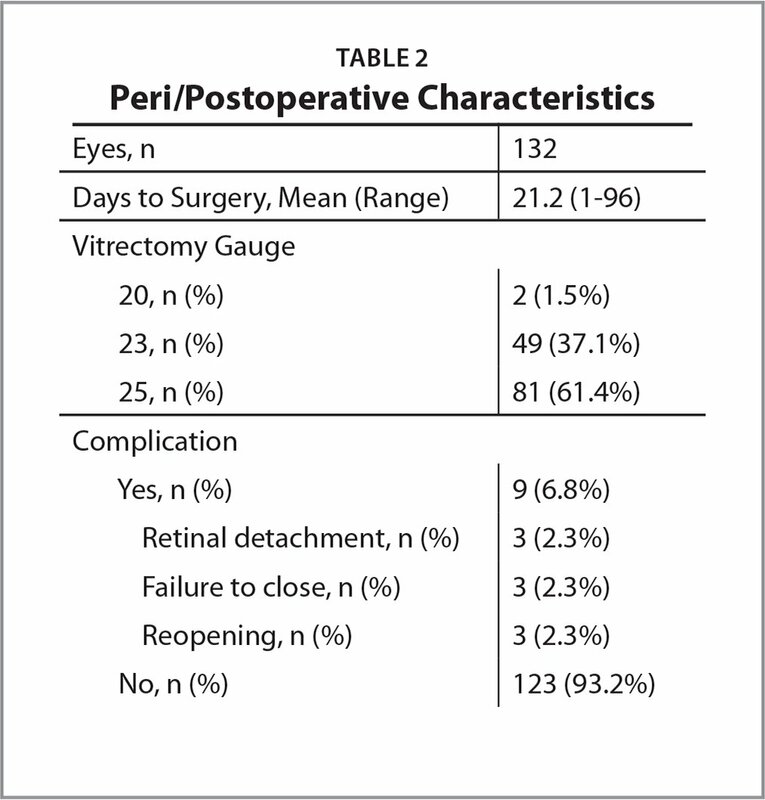 When compared with 20-gauge vitrectomy, small-gauge vitrectomy has been demonstrated to induce less postoperative ocular inflammation and quicker visual recovery.10 As such, the present study sought to determine the preoperative and operative factors that might predict Y1 and final postoperative VA in the era of small-gauge vitrectomy. The patient population analyzed reflected the shift to smaller gauge instrumentation as 98.5% of eyes underwent PPV with 23- or 25-gauge systems. Repair of FTMH leads to improvement in VA.3,4 In the current population, 86% of eyes had improved VA at final follow-up. Interestingly, VA may continue to improve beyond 1 year postoperatively for the entire group, as final VA was greater than Y1 VA (P = .06). However, this acuity improvement may be secondary to delayed cataract excision, as no significant improvement was seen between final and Y1 VA in eyes pseudophakic at baseline. Rounding to the nearest Snellen acuity, overall VA improved on average from 20/200 to 20/50 at final follow-up. This reflects a greater than 50% improvement from presenting VA on average. Most previously published studies on FTMH have been limited by follow-up of 1 year or less, although few have investigated outcomes beyond 12 months.11,12 The current work investigated longer-term predictors of VA at 1-year minimum and at average final follow-up of nearly 2 years. Following univariate and multivariate statistical analysis, several variables were found to be significant predictors of VA at each time point. Worse preoperative VA, as demonstrated in previous studies, was found to be a significant predictor of Y1 and final VA in both univariate and multivariate analyses (P < .001).2 Peri/postoperative complication (retinal detachment, failure of FTMH closure, or reopening) was also a significant predictor at both time points and with both methods of analysis (P ≤ .011). Presence of AMD, regardless of subtype, was similarly a significant predictor at both time points and with both analysis methods (P ≤ .007). Delay from preoperative assessment to surgery was found to be a significant predictor of outcomes at final follow-up in both univariate and multiple regression (P ≤ .037) but was not a significant predictor of Y1 outcomes. AMD was found to have a significant impact on VA at Y1, with an even greater influence at final follow-up. Although presence of any AMD may be expected to affect patient VA, the amount of this influence was striking since it was as significant as pre/perioperative measures. FTMH incidence in patients with AMD is known to be greater than that of the general population.13 Rao et al. reported a FTMH incidence of 1.1% in patients with dry AMD and 0.7% in patients with wet AMD.13 A previous study reported the incidence of intermediate and large drusen (3.6%) in patients with FTMH as 3.6%, and demonstrated decreased rates of hole closure in this cohort.14 Among the study population, 17.4% had AMD in addition to requiring surgical repair for FTMH, with most patients (73.9%) having dry AMD without GA. Although the current study was not adequately powered for AMD-subgroup analysis, the presence of any form of AMD was a significant predictor of visual outcome at both Y1 and final follow-up. The current study found that the improvement in VA after FTMH repair is significantly less in eyes with AMD than in eyes without.13 Additionally, even mild, dry AMD may significantly impact VA as the AMD population consisted of mainly dry AMD without GA (73.9%) and remained a significant predictor with all cases of wet AMD removed from statistical analysis. This finding is not surprising given that dry AMD can lead to damage of the RPE, which in turn can affect the photoreceptor layer. A “second hit” or injury to the retina with a FTMH may overwhelm the already damaged retina's ability to heal from the added mechanical insult of an idiopathic macular hole. Although surgery can successfully close the hole and improve VA to a degree, the underlying health of the RPE from damage associated with dry AMD may limit the extent of visual recovery. Wendel et al. demonstrated that patients with less than 6 months' duration of visual symptoms from macular hole had improved postoperative outcomes relative to those with longer symptom duration.6 Although duration of visual symptoms has been demonstrated to correlate with postoperative VA, the adverse effect of time delay from preoperative macular hole evaluation to date of surgery has not been previously reported. The current study found that length of delay (days) to surgery significantly impacted VA at final follow-up in patients undergoing surgical repair for FTMH in both univariate and multiple regression analyses (P ≤ .037), though statistical significance was not achieved for Y1 data (P = .228). Given that the effect of this factor manifested only with longer-term follow-up, previous investigations may not have discovered this result due to earlier termination of data collection. Reasons for delay to surgery from preoperative appointment include patient or staff scheduling difficulties, insurance coverage delays, lack of patient-perceived urgency, and other social factors. Given that our data analysis was performed with time delay as a continuous variable, we are able to assert that an effect was seen at final follow-up such that longer delay was associated with worse VA outcome but cannot distinguish an exact time point at which a patient would lose one line of vision, for example. As a retrospective, nonrandomized study, there are inherent limitations and biases present. Ten unique surgeons performed FTMH surgery, perhaps introducing variability, which may in turn influence VA. However, all surgeons performed ILM peel with PPV for macular hole closure, limiting surgical variability. R2 obtained from multiple regression models including preoperative VA, AMD, delay from perioperative appointment to surgery, and perioperative complications were relatively low, suggesting that additional factors not accounted for in the present analysis may influence VA after FTMH surgery. These factors may include findings based on OCT characteristics of FTMHs such as hole diameter, presence of epiretinal membrane, etc., but these imaging-based findings were beyond the scope of this study. As one might expect, the current study found preoperative VA and perioperative complications associated with worse vision in patients undergoing FTMH repair. Perhaps most interestingly, presence of any AMD was a comparable and significant predictor of poor visual outcome. Additional investigation is indicated to validate the current findings. Although identification of modifiable variables may facilitate achieving optimal patient outcomes, prognostic variables such as the presence of AMD offer tangible benefits in regard to expectation management. Parravano M, Giansanti F, Eandi CM, Yap YC, Rizzo S, Virgili G. Vitrectomy for idiopathic macular hole. Cochrane Database Syst Rev. 2015;(5):CD009080. Williams GA. Macular holes: The latest in current management. Retina. 2006;26(6 Suppl):S9–12. Holladay JT. Proper method for calculating average visual acuity. J Refract Surg. 1997;13(4):388–391. From the Department of Ophthalmology & Visual Sciences, University of Texas Medical Branch, Galveston, Texas (ALA, MMM); Retina Consultants of Houston, Houston (WCO, CCW, ARS); and Blanton Eye Institute, Houston Methodist Hospital & Weill Cornell Medical College, Houston (CCW, ARS). Dr. Wykoff has received grants and personal fees from Alcon Laboratories, Allergan, Clearside Biomedical, Genentech, Iconic Therapeutics, and Regeneron; personal fees from Alimera Sciences, Alnylam Pharmaceuticals, Bayer, D.O.R.C., ONL Therapeutics, Thrombogenics, and Valeant; and grants from Allegro, Apellis, Aura, NEI, NIH, Novartis, OHR Pharmaceuticals, Ophthotech, pSivida, Roche, Santen, SciFluor Life Sciences, and Tyrogenex outside the submitted work. The remaining authors report no relevant financial disclosures. Address correspondence to Ankoor R. Shah, MD, Retina Consultants of Houston, 6560 Fannin St., Suite 750, Houston, TX 77030; email: arsmd@houstonretina.com.